I think it must have been in the mid to late 80’s when Chili con carne became the new lasagne and was featured on most pub menus and often at home too, with the emergence of El Paso products, such as tacos and tortillas! 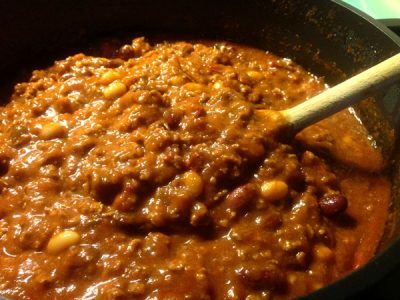 The wonderful thing about a chili con carne too is that you can make it hot as you like or make it mild for the kids and slowly spice it up as they get used to the taste. I often make chili con carne for the in-laws and their friends too or make up a big pot when we’re having a party. It always goes down well and I really love it with the addition of chipotle peppers in Adobo. It gives it a warm rich smokiness and some heat too. Chili sin carne can also be just as fulfilling to make or use soya or quinoa mince instead of meat! I always suggest that you try out the recipe and then make it your own by adding or taking away seasoning. I have also heard that chopped banana can be a nice addition to the chili con carne too according to Thomasina Miers. Give it a try! In a large non-stick saucepan over a medium heat fry the onions until golden, add the garlic and chopped Jalepeno, stir for a few minutes then add the meat and fry until browned. Cook together for 5 minutes or so, then add your chili powder, depending on how hot you like your chili, and the cumin and coriander and stir the tomato purée mixture. Slowly add the stock, stirring constantly. Then the tomatoes, kidney beans, sweet corn and or baked beans, the oregano and bay leaf. Season with a pinch of salt and plenty of freshly ground black pepper to taste. Bring to a simmer, then place on a lid, reduce the heat and leave to simmer gently for 45 minutes to an hour, stirring occasionally until the sauce thickens. Taste to see if you need to adjust the seasoning. Serve with some plain boiled rice or tortillas and some grated cheese.